What direction do you point? What's interesting is that they also place a whole lot of famous figures on the map as well, and currently I'm closest to the Dalai Llama and far far away from Bush (surprise surprise). Ok, that's about as much political jonx I'm going to subject you to anyways. Now back to bask in the tanning rays of my monitors. You know the best thing about that test. You can reverse engineer it and come out wherever you want. 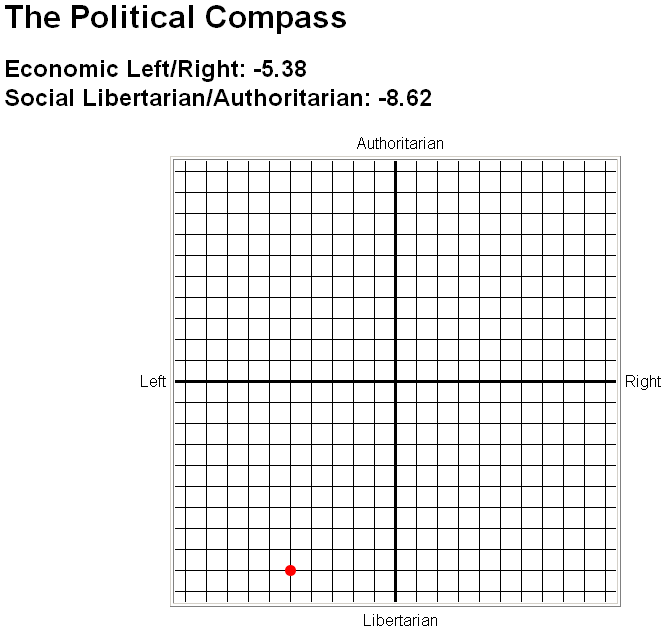 So, I can now re-define myself as a bottom lefter. Scott: you could. But what would be the point? Cyrus, you are an anarchist! Radu: Shhhhhhhhhhhh. Don’t say that too loud, _they_ might come to get me. What kind of sick freaks are they then?? What kind of sick freak are they then?? hehehe. Perhaps I should have said "the test is rigged to produce a high number of libertarian outcomes relative to their actual distribution in the population," but I thought that lacked a certain rhetorical snap, crackle and pop. Basically, I think Ghandi was a moderate conservative. Cyrus: you could. But what would be the point? The same reason people die trying to climb Mt. Rainier. Because it’s there! Cy: Your score reminds me of a bumpersticker I saw yesterday. I’m Libertarian: I’m Pro-Choice on *Everything*!